Rich people in the modern world have ‘safe rooms’, where they hole up if danger threatens. Masada was King Herod’s ‘safe room’. He transformed a lonely desert fortress into an almost impregnable citadel – and a luxurious refuge. Who was King Herod the Great? He was a complex person. 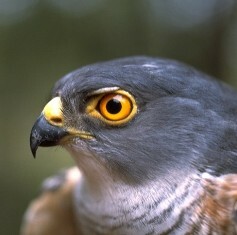 A ferocious fighter, he also loved luxury, and in Masada’s two ornate palaces he indulged his taste for lavish living. Was he mad as well? He was certainly paranoid, seeing enemies in every corner. 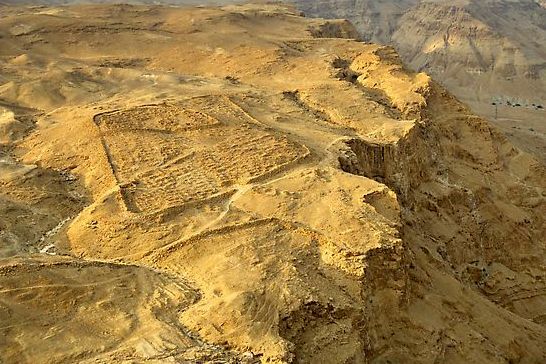 He reinforced Masada’s walls and built large store houses, barracks – and immense water tanks holding nearly 750,000litres (200,000 gallons) of water, so that he could hold out there if the worst came to the worst, and he was cornered. 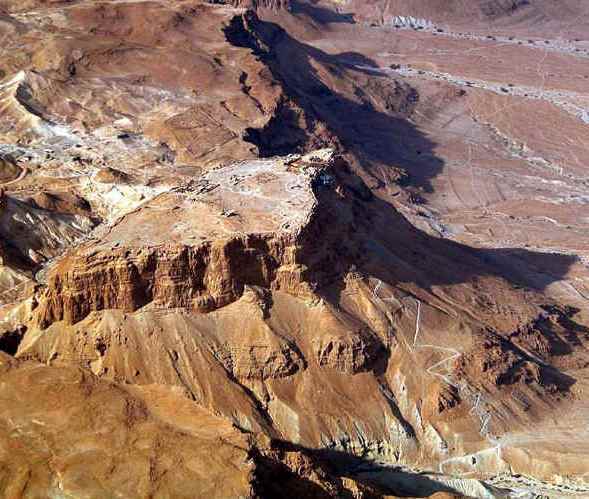 Was Masada was impregnable? Almost. When the Jewish people rebelled against Rome in 66-73AD (well after Herod had died), it took a Roman army of 10 – 15,000 battle-hardened soldiers, fighting a defending force of less than 1,000 (many of them women and children), two years to conquer. In the TV series ‘Rome’, Herod the Great is a slippery customer – which is just as it should be. King Herod was cunning, manipulative and ruthless. See the scene on Youtube. The TV series does not, however, do justice to the brilliance of the man – his diplomatic skills, his intelligence and above all his ability to make friends with the ‘right’ people. Map showing the extent of King Herod’s building programs. Herod thought BIG. 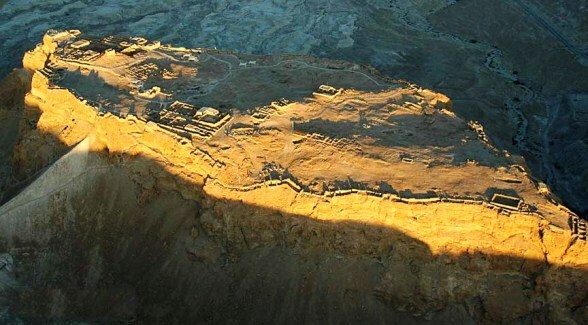 At Masada, Herod completely rebuilt the former fortress, and surrounded the mountain-top with a wall nearly a mile long – even though the site was well-nigh inaccessible to an attacker. He turned the arid plateau into an almost impregnable citadel, building a defensive wall of dressed stone seven furlongs in length, eighteen feet high and twelve feet broad. It was strengthened with towers that rose to seventy-eight feet and surrounded by a casemate wall (two parallel walls with partitions dividing the space between them into rooms). It is 1400meters long and 4meters wide and was built along the edge of the plateau, above the steep cliffs, with a number of towers. All this was done on an impossibly difficult site. Building materials had to be transported long distances, then carried up the steep, narrow path to the summit of the plateau. The amount of blood, sweat and tears that went into the building of Masada beggars belief. 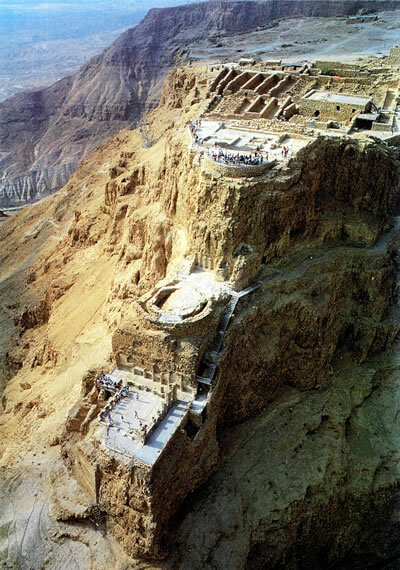 Masada – what was there? Building a palace/fortress of such magnificence in such a remote site was a triumph of skill and determination. There were barracks, a sumptuous palace, ammunition and food stores – and vast water reservoirs not only for the people who lived there, but for garden plots that grew fresh vegetables, and for public and private baths. 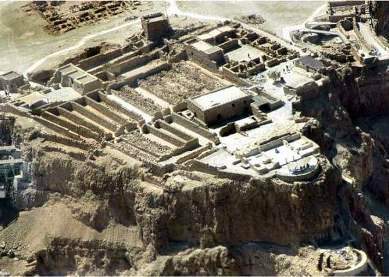 The fortress-palace of Masada was its own world. Isolated as it was in the rugged wilderness, it could survive for long periods of time without help or supplies from the outside world. 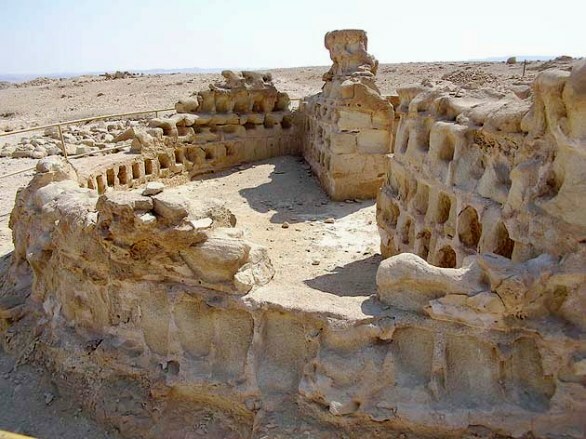 Its water storage system and hoard of food supplies made it independent – which is exactly as Herod had planned. a sumptuous villa built on three terraces at the northern end of the site. Masada was a micro-world, with everything a community needed to survive in a hostile environment. It also had full Roman baths, mosaics and frescoes – but no decoration that clashed with, or offended against, the Second Commandment (Thou shalt not make for thyself a graven image), which Jews at that time interpreted as meaning they should not create images of any living creature. Few people realize how large a king’s retinue was in ancient times, and how much space was needed to house the small army of people who accompanied him wherever he went. Herod’s relatives (by blood and by marriage), together with his personal bodyguards and friends, made up the wealthiest section of the entourage. fifteen children, twenty grandchildren, thirteen great-grandchildren and, towards the end of his life, even two great-great-great-grandchildren. There were, as well, a large number of assistants, eunuchs, butlers, grooms, tutors, musicians, entertainers, porters, physicians, barbers, cooks, stewards, secretaries, freedmen and slaves. The Jewish historian Josephus, our best source of information about Herod the Great, mentions almost one hundred such people by name – and there must have been many others as well. Most of these people travelled with the king, and had to be fed and housed wherever he stayed. The photograph above right shows just some of the storerooms (see an enlargement in the Photo Gallery at top of this page). The area on the summit of Masada, large as it seems, would have been crowded whenever the king was in residence. Even in this waterless region, Herod built cisterns of such capacity that they were enough to supply baths and water gardens. The efficiency of his catchment system became evident when, from a single thunderstorm, the tanks were able to collect enough water to avert the surrender of the large garrison. He laid up enormous stores of food and weapons when he thought that Cleopatra might persuade Antony to give her Herod’s territory – there was a very real danger of this at one time. The fortress-palace of Masada perched like an eagle above a landscape that is almost lunar in its desolation. It made the perfect fortress. The boat-shaped mountain on which it sat rises 434meters (1,424ft) above the desert, with cliffs falling steeply away on every side. The Hasmonean royal family was the first to recognise its potential. They fortified it in 100BC, and retreated there whenever there was danger – which was often. 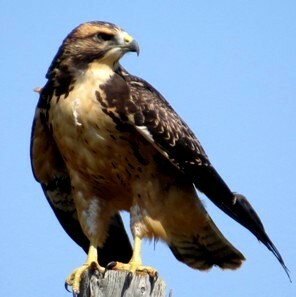 From his eyrie, Herod could gaze at the human ants crawling on the great plain far below. 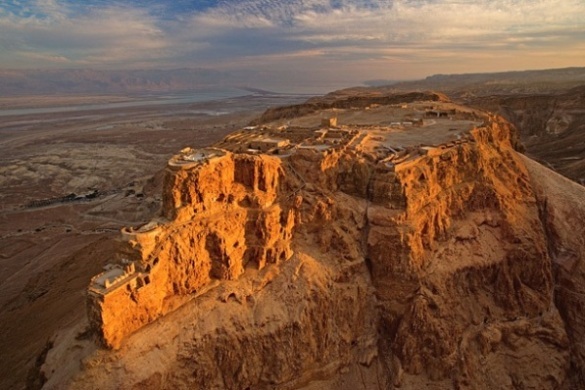 But Masada’s fame came from later events, when Jewish rebels holed up there against the Roman army and committed mass suicide when the stronghold fell. 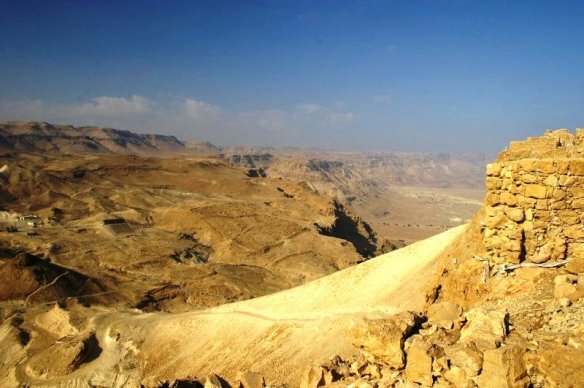 the other across the saddle back which links the isolated cone of Masada and the massif of the Judaean hills to the west. Even this approach was so difficult that it was known as ‘the serpent’, or the ‘Snake Path’. You can see part of it in the photograph at right. • all the food and drink needed for a large number of people. 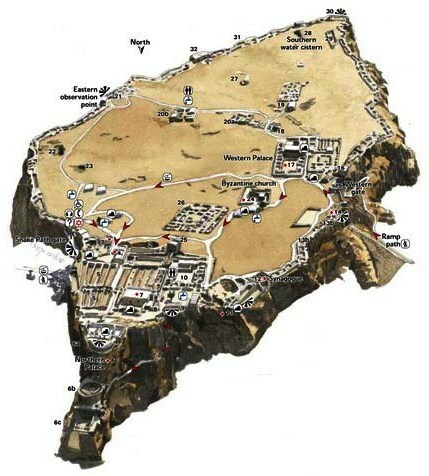 Masada dominates not only the sea but also the caravan route, which in antiquity ran across a causeway from the western shore of the sea to the tongue of land which juts below Kerak – on its way to Petra in south Arabia (see map above). Rome watched its provincial rulers closely. One false move, and a king like Herod could be dethroned and executed. So Herod took care not to give the Romans any reason to distrust him. But he was a man of enormous drive, and if he could not find an outlet on the battlefield he must find it somewhere else. This he did, by pouring his energy into one of the greatest building programs the ancient world ever saw. He used architecture to impress observers with the splendor of his kingdom. Jerusalem and its Temple became one of the most magnificent capitals in the eastern Roman empire. The fortress of Masada was also meant to impress – and it did. These jewel-like buildings (above) clung to the side of a cliff at Masada, each building linked to the next by narrow stairs cut into the rock. 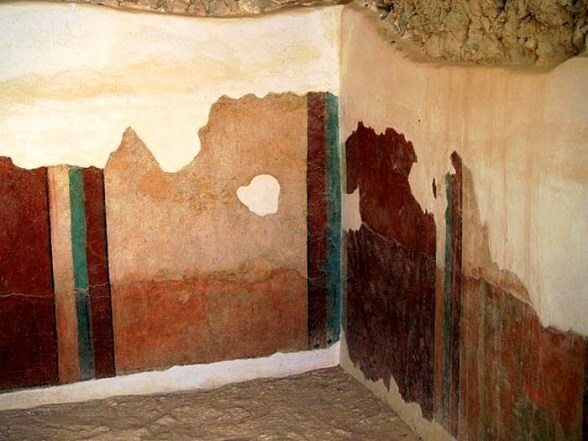 The lowest building had a small private bathhouse, its walls covered in frescoes. Herod showed he could build where no-one else would dare. The three small palace buildings were created for nothing more than pleasure and ostentation. They were splendidly adorned, with living quarters for Herod and his relatives – including the lovely, tragic Queen Mariamme, a bird in a gilded cage if ever there was one. 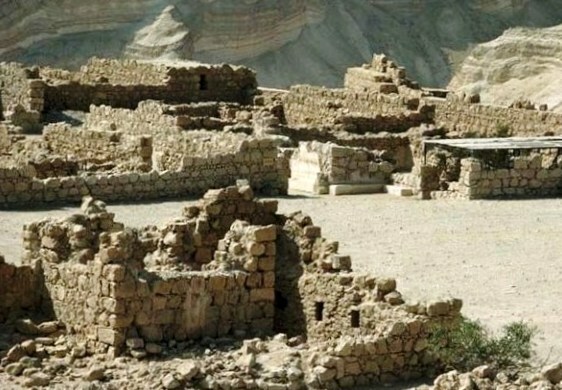 The elegant Northern Palace, dripping with luxury, was separated from the Masada fortress by a wall, affording total privacy. A narrow, rock-cut staircase connected the three levels. On the upper terrace were living quarters. In front of them was a semi-circular balcony with two concentric rows of columns. The rooms were paved with black and white mosaics in geometric patterns. The two lower terraces were intended for entertainment and relaxation. They were like little jewel-boxes. The middle terrace had two concentric walls with columns, covered by a roof. This created a portico around a central courtyard. the administrative buildings, library, staff quarters, etc. The temperature at Masada could be brutally hot in summer, but the dry air preserved the architecture from deterioration. Archaeologists found columns, capitals, friezes and cornices, as well as mosaic floor decoration and wall paintings. Many of these were from the Western Palace, the largest building on Masada, covering over 4,000 square meters. 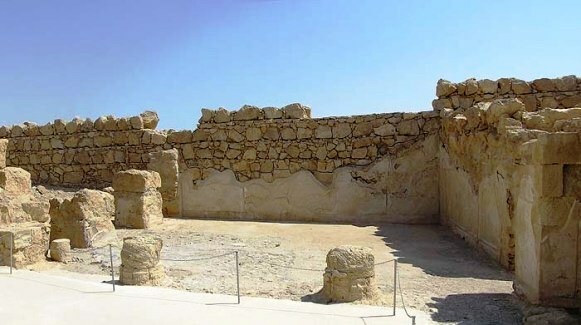 Located along the center of the western casemate wall, it served as Herod’s official residence. 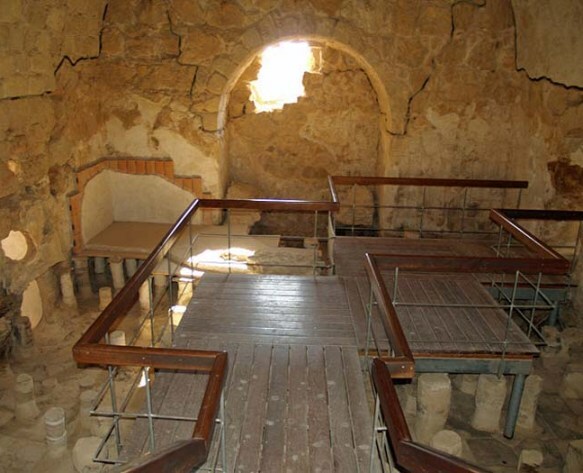 Was this Herod’s throne room? 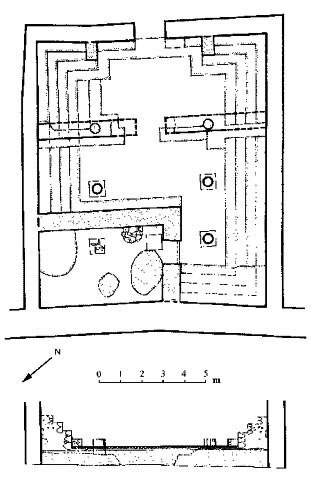 On the southern side of a central courtyard was a large room, possibly a reception room or audience chamber. The entrance was wide, flanked by two columns supporting the roof. Its walls were decorated with moulded panels of white stucco. 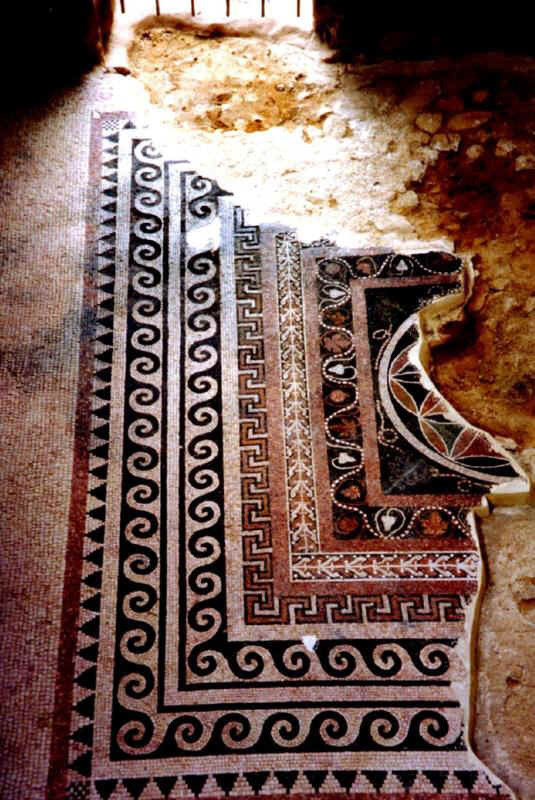 On the eastern side were several rooms with splendid mosaic floors. 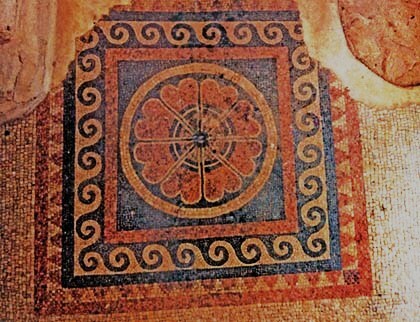 One of these, the largest room, had a particularly decorative floor with floral and geometric patterns within several concentric square bands. This room may have been King Herod’s throne room, the seat of authority when he was in residence at Masada. 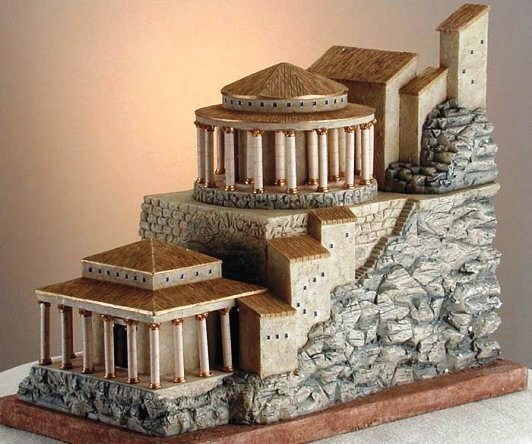 simulated stone, in suitable colors – something like the Pompeian Second Style. The columns in the Western Palace are Corinthian, the most popular style at that time. They are backed by wall paintings of simulated marble. 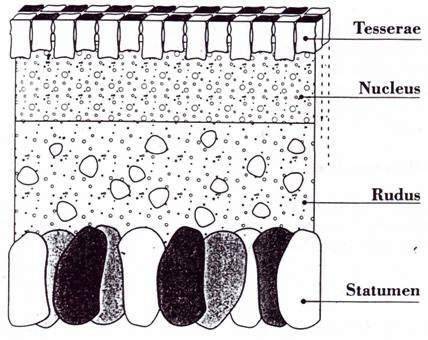 See a reconstruction at right. 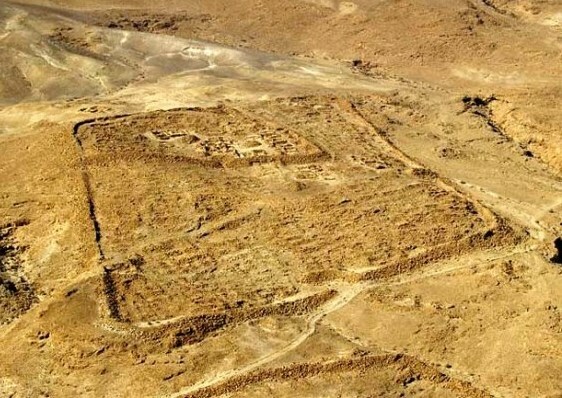 Herod built a synagogue at Masada, measuring 12.5×10.5meters, with tiers of plastered benches around the walls on which people sat as they listened to prayers, readings and discussions. This particular synagogue is gone now, but visitors to Masada today see ruins of a later synagogue, one used by the Jewish rebels. It was built into a previously existing room whose interior dividing walls were knocked out and its pillars rearranged. It has a set of tiered seating benches around the wall – see below right for a floor plan of the synagogue. seating in pillared porticoes on either side. Synagogues revolutionized worship in the ancient world – and in our own, for that matter. There was an internal storage area built into the northwestern corner, perhaps used to store scrolls too old to use but too sacred to discard. 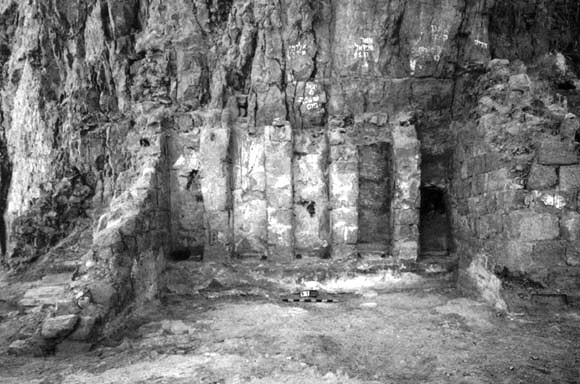 Fragments of two scrolls were placed in two pits dug under the floor of this synagogue – presumably by the Jewish rebels just before the Roman soldiers broke through. These were preserved by the dry climate until they were discovered two thousand years later. It is interesting that these two scrolls were from Deuteronomy and Ezekiel. Both these books have material that could have inspired the rebels. Click on this link for these Bible passages. people who lived there were in fact only tenant farmers. roles – the Temple priests should hold the real power. But the Herodian dynasty had ignored Ezekiel, putting itself ahead of the Jerusalem priests in power and in wealth. The defenders of Masada, faithful to their Scriptures, would never accept this. Remains of the synagogue at Masada. Each synagogue became the focus of community life – at Masada as much as anywhere else. This innovation made worship of God accessible to ordinary people. The synagogue became the focus of Torah study and of prayers – and of social and cultural life.Other monotheistic religions adopted this pattern of worship, and it became the model for Christian churches and Islamic mosques. a small pool at the entrance for washing hair, hands and feet before entering the main pool. The purpose of the monthly immersion in the mikveh was physical and spiritual cleanliness. The washing of the body was a tangible way to refresh mental, emotional and physical energies, giving each person a fresh start. The rules of ritual cleanliness meant that most men and women were obliged to wash themselves, wash their clothes, and put on clean clothes at frequent intervals. There is no doubt that the hygiene that resulted from the purity laws was beneficial to the health of the whole nation. 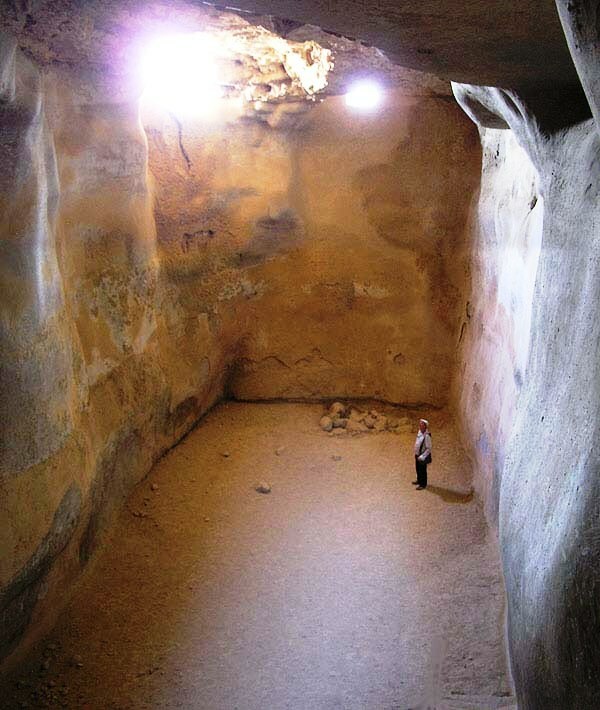 What was Masada’s storeroom complex? Masada was essentially a fortress, a safe haven built to withstand a long siege, so the higher northern side of the plateau was packed with storage and administrative buildings: rows of long halls opening onto central corridors. They were behind a wall, so they did not encrouch on the luxury buildings. For a better idea of the layout, see Store rooms in the Picture Gallery above. food and drink available in the Roman world at the time. At certain times of the year there could be hundreds of people living on the high plateau of Masada. All of them had to be fed, housed and clothed. equipment for personal retinues of bodyguards, servants, cooks, grooms, butlers, etc. 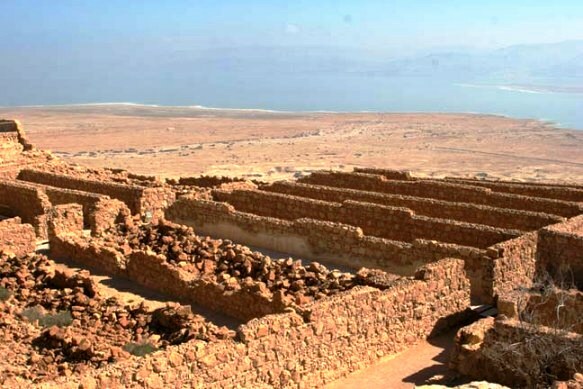 The climate at Masada is extremely dry, and even though almost two thousand years have passed, excavators found scrolls containing remnants of two Biblical books. The library probably also held administrative and reference scrolls, which were stored horizontally on shelves in niches/cupboards cut into the rock face in the Northern Palace. 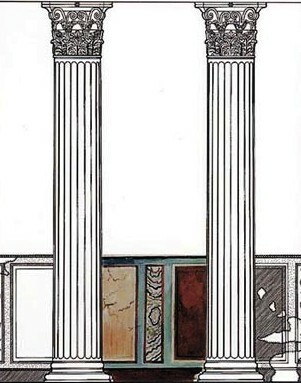 The reconstructed design of the cupboard doors shown below is typical of Roman interior detailing of the period. The scrolls were from the Books of Deuteronomy and Ezekiel (see below for extracts from these books) and may have belonged to the Zealots who made their last stand at Masada. 15 you may indeed set over you a king whom the Lord your God will choose. One of your own community you may set as king over you; you are not permitted to put a foreigner over you, who is not of your own community. 1 The hand of the Lord was upon me, and he brought me out by the Spirit of the Lord and set me in the middle of a valley; it was full of bones. In another part of the palace was a large bathhouse. 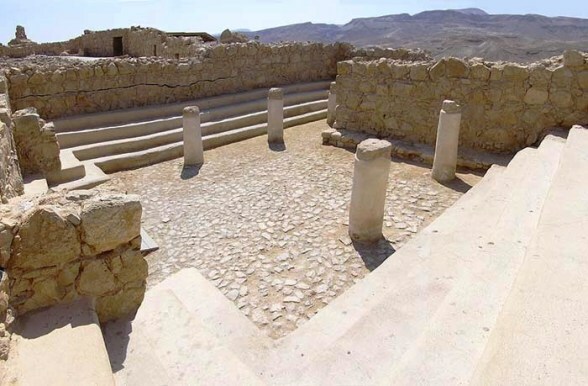 Elaborately built, it served guests and senior officials (Herod and his family had a private bathhouse). It had a large courtyard surrounded by porticoes and several rooms, all with mosaic or tiled floors and some with frescoed walls. It would be a mistake to think of the bathhouse at Masada as simply a place to get clean. For Romanized Jews like Herod, the bath was a social ritual, a place where you met your friends in a relaxed atmosphere, talked, told a joke or two, and simply whiled away the time. Only the rich could afford a private bath like this. Ordinary people went to public baths. Herod’s ornate baths were an important status symbol. But their status value goes right off the radar when you realize how precious water was on this isolated, arid plateau. The largest of the rooms was the hot room (caldarium, see above). The heat in this room was like a Turkish bath. Its suspended floor was supported by rows of low pillars, making it possible to channel hot air from the furnace outside, under the floor, then through clay pipes along the walls. 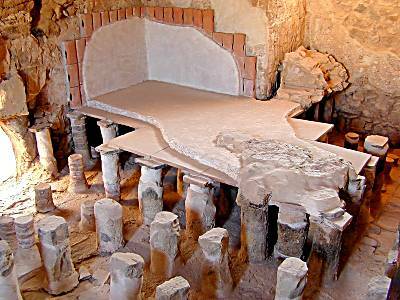 The warm air of the caldarium had a purpose: heat releases dirt from the pores of the skin, making it easier to remove. Each bather was rubbed all over with olive oil, then used a strigil or scraper to remove the dirt. After this, the bather went to the frigidarium or cool room, or plunged into a swimming pool before getting dressed again. 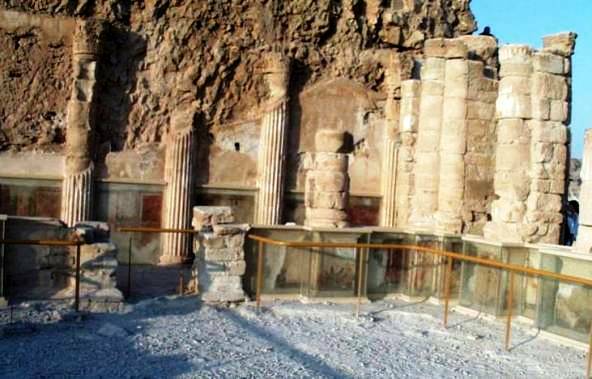 See frescoes in the thermal bath at Masada and the partly reconstructed caldarium of Herod’s bathhouse in the Photo Gallery above. 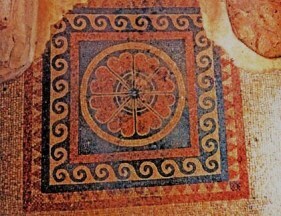 colored mosaics such as the one at right. 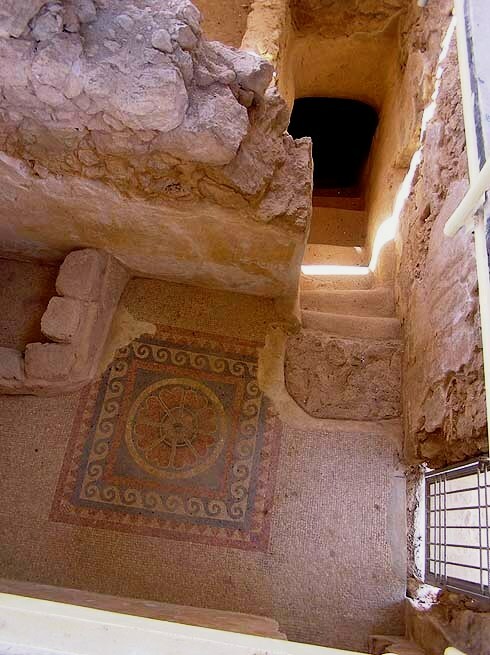 See the Photo Gallery above for more mosaics at Masada. One of them shows common Greek patterns, but it has dominant symbols which represent the Seven Kinds of Produce mentioned in Deuteronomy 8:8: ‘wheat and barley, vines and fig trees and pomegranates, olive trees and honey’ – which the Promised Land would give. 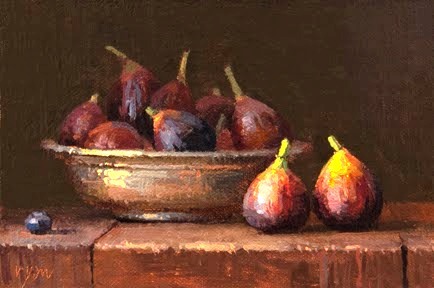 Representations of fruit do no break the Second Commandment, which forbids images of living creatures. Masada sat on the top of a barren, windswept plateau. 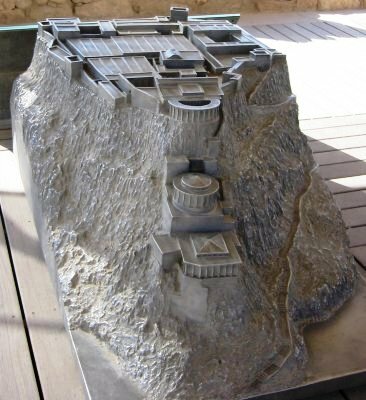 It had no natural water supply, so Herod’s resourceful engineers cut vast water reservoirs into the rock underneath the fortress on the northwestern side of the hill. During the winter downpours they filled with rainwater. See Photo Gallery at top of page for a photograph of one of the cisterns. 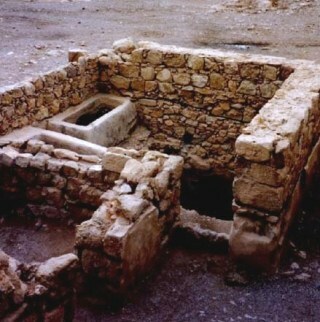 These cisterns supplied the immediate needs of the residents of Masada and could be relied on in time of siege. 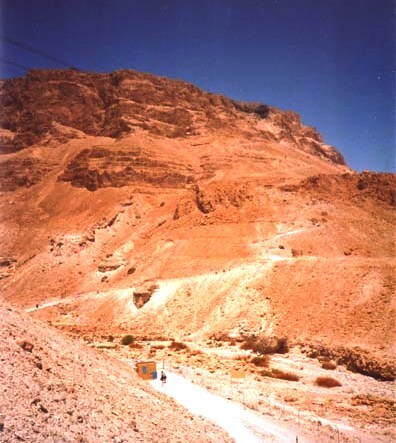 They also allowed the desert to bloom: the garden plots on the wind-swept summit of Masada were even able to provide fresh fruit and vegetables. The cisterns also furnished water for the elaborate baths with which the palace was equipped, and the mikvehs or ritual baths which were (and still are) an important part of Jewish religious ritual. The Roman camp is at F in the upper left corner. 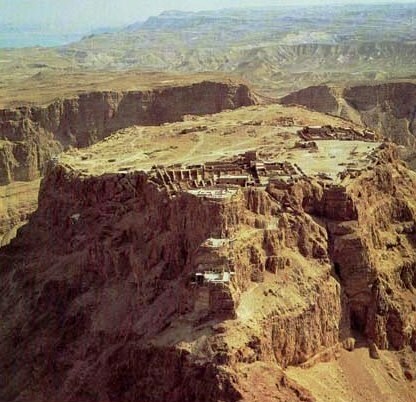 In 66 CE, at the beginning of the Great Jewish Revolt against the Roman Empire, a group of Jewish patriots overcame the Roman garrison at Masada. It now became the last remaining rebel fortress in Palestine, and the Romans threw their best resources into capturing it. It held out for almost two years, but was eventually captured on 16th April, 73AD, after a siege in which the courage of its defenders was matched by the deadly resolve of the Romans. Why did the Romans use siege tactics? Siege was always part of warfare in Israel. From the time of the United Monarchy onwards, Israel’s soldiers were all too familiar with the methods their enemies used to assail the cities. But at Masada, the rebels believed themselves to be in an impregnable fortress. However, the Romans were past masters of siege warfare, and had military engineers of genius. 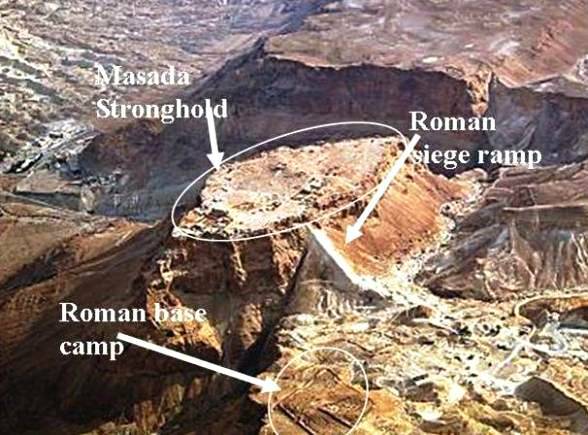 So when they prepared to assault Masada, they had the resources to build an enormous ramp that led from valley floor to summit. 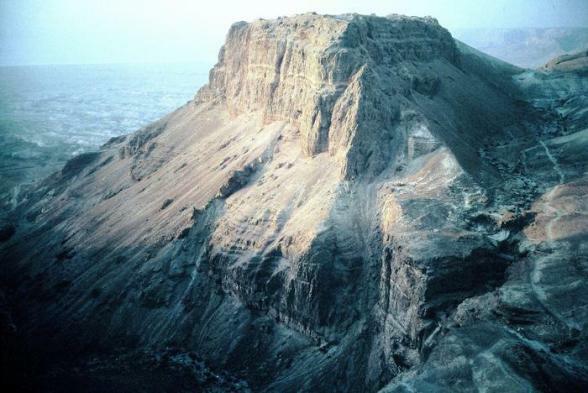 Geologists have suggested that the ramp was built along the top of a natural spur of rock leading to the summit. The Roman engineers simply took advantage of this geological feature. They knew they could not use the ‘Snake Path’ because it was too open, too vulnerable to attack. Soldiers would be easily targeted from the walls above. So they built the gigantic siege ramp, still visible today, so that they could penetrate the walls and overcome the defenders by sheer weight of numbers. All the defenders of the fortress, except two women and five children, died by their own hand. 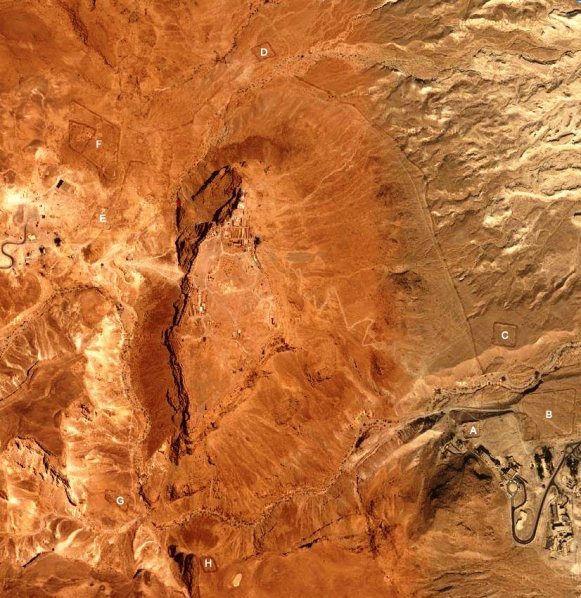 The image above shows the outline of the Roman army camp – the air in this remote region is so dry that even now the outline is clearly visible. From the size of the camp, historians can estimate the numbers of the besieging force, estimated at ten thousand men. The camp followed the layout of a typical Roman encampment. It was divided into two areas by a central street, called the via principalis. At each end of this road were two gates, the porta principalis dextra and the porta principalis sinestra. Facing the enemy was the porta praetoria, and at the rear was the porta decuamana. Quarters for the soldiers occupied about two-thirds of the area; in the other one-third stood the tents of the general, the quaestor and the tribunes, as well as open space for a forum. There was also a subsidiary camp containing an infirmary, a blacksmith’s forge, and a farriery for horses. The modern world seems to think it invented urban terrorism. It did not. It was the Sicarii, or sica-users, (a sica is a short and easily hidden dagger) who were among the first to do this. The Sicarii, who were a fanatic branch of the Zealots Movement, operated at a time when Jerusalem was crowded, when they were more likely to create maximum disruption. 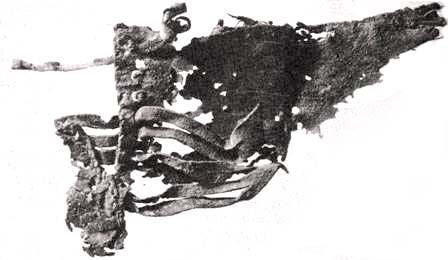 The sicas (short daggers) were easy to conceal in the flowing garments worn at the time. The terrorist, for that is what he was, waited until people were crowding around the person he meant to kill, then jostled against him, stabbing him. In the ensuing hysteria, the victim bled to death. Second, before modern media coverage was available, “the festivals were their special seasons” not only for protection within the crowds, but also for the maximum public awareness of their activities. Fourth, that initial success led to the inevitable result of “greater troubles” as the Sicarii continued regular high-profile kidnappings for successive prisoner releases. Excavating Jesus, John Dominic Crossan & Jonathan Reed,Harper Collins, 2001, p146. In the summer of 69AD, the Emperor Vespasian entrusted Titus with the suppression of the Jewish Revolt. In the following year, after a siege of four months, Jerusalem fell. The Temple of Jerusalem was destroyed, and the contents of its treasury were looted and taken to Rome. 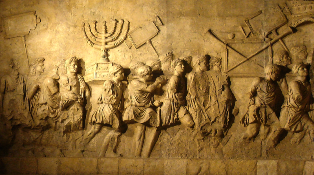 The photograph at right is taken from the Arch of Titus: the Roman troops march through the main thoroughfare of Rome, carrying tangible evidence of their victory: most notably the sacred seven branched Menorah used in Temple ceremonies. Titus’ treatment of his Jewish prisoners was ruthless, and it is not surprising that the Zealots at Masada later decided to die rather than fall into his hands. Here’s an interesting if little known fact: so massive was the haul of gold removed from the Temple, that the price of gold on the Syrian market fell to half its former value. The key to what happened next lies in the need the rebels had for weapons. Weapons were, in essence, why the Zealots were at Masada. When a revolt begins, rebels need arms because they do not have a ready supply to hand, as a standing army does. They may have caches of hidden weapons, and indeed the Jewish rebels had been planning revolt for decades. But a cache of hidden weapons does not equip an army. Rebels can resort to another stratagem to arm themselves: they can raid a government armoury. This is what the Zealots did at Masada. Herod the Great had left an enormous arsenal there: arms for ten thousand men, with large stores of food and munitions. 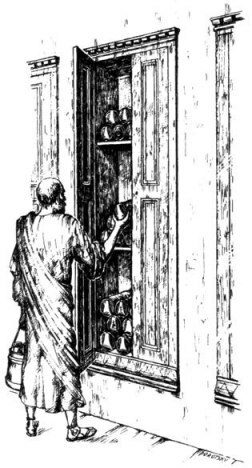 He had stored them there in 34BC when he thought he might have to fight Cleopatra. The dry climate had preserved them for a hundred years. One of the Jewish leaders, Manahem, saw his opportunity. When rebellion broke out, he travelled south to Masada. He surprised and killed the Roman garrison stationed there, gathered up the arms, left a detachment of his own men in the citadel, and returned with his much-needed booty to Jerusalem. As part of its mopping up activities after the fall of Jerusalem, the Roman army surrounded Masada, cut off its links with the outside world, and began a long siege. Josephus tells the dramatic story of those defenders who occupied the fortress in the Jewish Revolt. They had survived by using the vast stores of wheat, water, wine, and weapons in the storerooms, but as the massive Roman siege ramp grew nearer and nearer to the top of the cliff wall, the Zealots knew they had no chance. So they decided in the end to take their own lives instead of dying at the hands of the Romans, or becoming slaves. The truth is that they would almost certainly have been killed anyway. The soldiers preferred to make a profit from their captives, but the Masada rebels would not have fetched a good price, since by now Jewish captives were a drug on a shrinking market. According to Josephus, the Zealots and their families committed mass suicide the night before the Roman army burst through a breach in the wall at Masada. Their deaths probably happened in the storehouses at the rear of the Northern Palace, which the Zealots had used as living quarters, building makeshift walls dividing the long rooms into smaller ones, suitable for a family. The Zealots and their families probably died within these rooms. When the Roman soldiers completed the siege ramp and entered the fortress, they were met with complete silence. The Jewish defenders were all dead. All that was left were some pathetic personal possessions of the defenders and their families: fragments of fabrics, leather sandals, skeletons, skulls and plaits of hair. Nine hundred and sixty people, following and going beyond the ancient tradition of martyrdom, had committed mass suicide. Only two women and five children were left alive. Thus the rebellion ended at Masada.